We hope many of you still remember “Cloudy Chair” by Mater – yes yes, exactly the one which was spotted on DR1 program “Aftenshowet” couple of weeks ago. 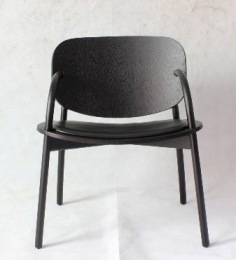 Now we are back with great news for this designer chair’s fans – soon Mater is launching a new version of “Cloudy” which is specially designed for dining and contains a black leather cushion on top. 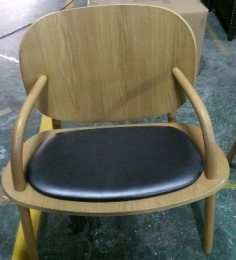 The chair is super fancy as made of the European oak and high-quality leather. Just look above how comfortable and elegant it looks like – immediately invites for a fancy dinner! By the way, next week Nichlas is already in China where he visits the factory – the home of “Cloudy”. During the trip, Nichlas takes care that these designer chairs are packed properly and shipped here to Denmark. We expect that by the beginning of this summer, the new version of “Cloudy” will finally reach all Mater’s stores. For your curiosity, take a glance below at how “Cloudy Chair” looks during and after production. The difference is like day and night, isn’t it?